For first-time owners, rules about feeding a baby bird can be confusing. Here’s a straightforward feeding plan that can drastically reduce feeding problems for baby birds. For first-time owners, rules about feeding a baby bird can be confusing. Often, new parents are told that the bird’s crop – his gullet – should be filled each time it empties until the baby learns to feed itself. Misunderstandings can occur easily over definitions of “full” and “empty” – all to the detriment of the bird. Other times, owners are simply directed to feed the bird a specific amount of food at certain intervals throughout the day. Following that advice, novice owners may force the baby to eat, regardless of how the bird reacts. 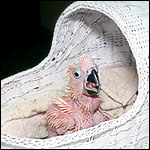 The weaning process exacerbates this scenario because weaning-age babies have completed their first growth phase and require substantially less nutrition than a younger bird. If babies are overfed at this stage, they may not become hungry enough to want other food, and in some cases, the baby will try to resist food only to have formula forced upon him. Such a struggle can end disastrously, with the baby inhaling his food, leading to pneumonia – or even asphyxiation. Here’s a straightforward feeding plan that can drastically reduce these kinds of feeding problems for baby birds. The maximum amount of formula that should be fed to any baby prior to weaning should be approximately 10 percent of his body weight. The length of time between feedings should be determined by the amount of time it takes his crop to empty. (The crop is sufficiently emptied when you can feel little or no food remaining in the gullet, although it may remain slightly pendulous.) For most baby birds, it takes between four and six hours for the crop to empty. Once every 24 hours, preferably at night, take a break from feedings. For example, if your bird’s crop empties every four hours, you should be feeding him every four to five hours between 6 a.m. and midnight. Starting at midnight, though, leave at least a six-hour period of time for extended crop emptying, which will allow residual food (and its increased numbers of bacteria) to be eliminated. Not coincidentally, taking a break also allows you to get some sleep. As the baby grows, plan on fewer feedings, using slightly more formula. While there is a theory that some species do better with frequent small feedings, the problem with this approach is that few people - breeders or owners - can maintain a high-frequency feeding schedule. The most important thing, though, is to control the amount of food offered at each feeding: Never allow the amount of formula to exceed 10 percent of the baby’s weight. As the baby matures, he will begin to resist feeding. At that point, either reduce the number of formula feedings or eliminate them entirely. When feedings have reached only two or three a day, start your bird on solid food in the form of softened pellets or table food. If only two feedings remain and the bird resists food at night, eliminate the next morning’s feeding. Over the next two or three weeks, the bird should get used to eating solid food, and you can cut out evening feedings altogether.